When my classmate Abbie Spica and I were told we would be transcribing two pages of a medieval manuscript for an assignment in our History of the Book class, the task seemed almost comical in its impossibility. When Professor Noonan brought in a full goatskin, bottles of oak gall ink, and goose feather quills to class, however, we knew she was serious. Crowded around a table in the Rare Book Room of the Cushwa-Leighton Library at Saint Mary’s College, our class was presented with three medieval manuscripts. In turn, we stepped up to the relics so that we might briefly explore their pages. A quiver of anticipation ran through me as I leafed carefully through the quires of ancient skin. They felt rough and smelled vaguely of dust and decay; against my fingertips they were frighteningly delicate, yet durable. I marveled at the patterns, insensible to my untrained eye, written across the pages in handmade ink, pausing to wonder at the tiny holes, eaten through by bookworms (which I didn’t know actually existed before this class), and felt a sense of profound privilege to be handling something so old. Abbie and I partnered up for this assignment. 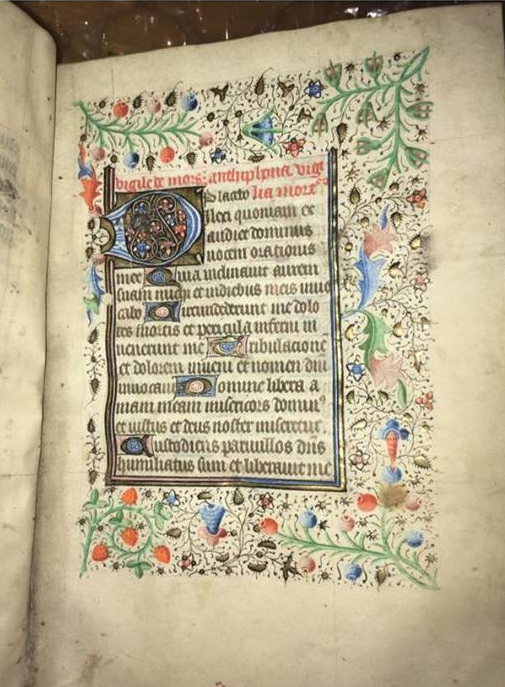 We chose St. Mary’s College MS 3, a Book of Hours created around Amiens, France between 1450- 1478. The Féron family of Haut Picardie owned it initially. Later, it ended up with the Grisel family, who owned it until 1586. A Book of Hours is something that would have been precious to a household or institution, and handled daily by laypeople. 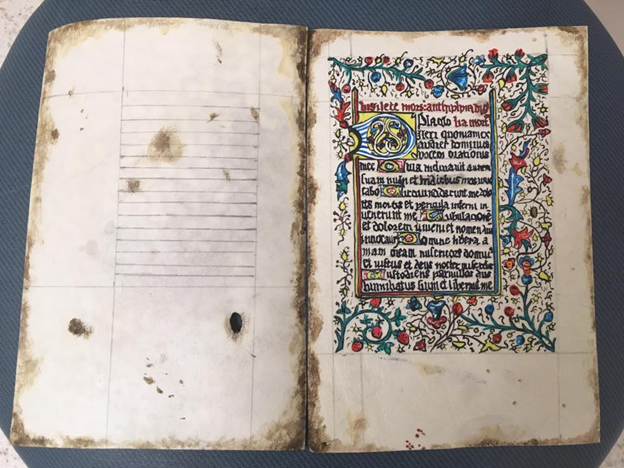 I was drawn to a beautifully illustrated and illuminated page, the beginning of a chapter, judging by the large initial, complete with rubrication and tiny, nearly microscopic detail. I looked up at Abbie, an expression of wide-eyed admiration still lingering, and murmured, “I want to be a crazy person and do this page.” Despite the intricacy of the folio, the blankness of its corresponding page, and the time commitment neither of us felt we had room for, Abbie agreed to the challenge. A close up the verso and recto sides of the folios reproduced for this project. St. Mary’s College MS 3, fols. 70v-71r. Published with permissions from St. Mary’s College’s Cushwa-Leighton Library. We split up the work according to our talents. Having some training in art, I took up the task of illustrating. Being analytical in mind and capable of producing impeccable handwriting, Abbie chose to line and rule the pages and work with the calligraphy. Abbie knew a small amount of Latin, but not enough to make sense of the words written down; I could not even decipher the handwriting, let alone the language. Devoid of meaning, the words were reduced to lines and strokes and flourishes. Abbie did not try to piece letters together into a sensible word; she just followed the information her eye gathered about the lines, and worked from there. It is difficult to say, in the end, whether the absence of meaning made her challenge more difficult or not. 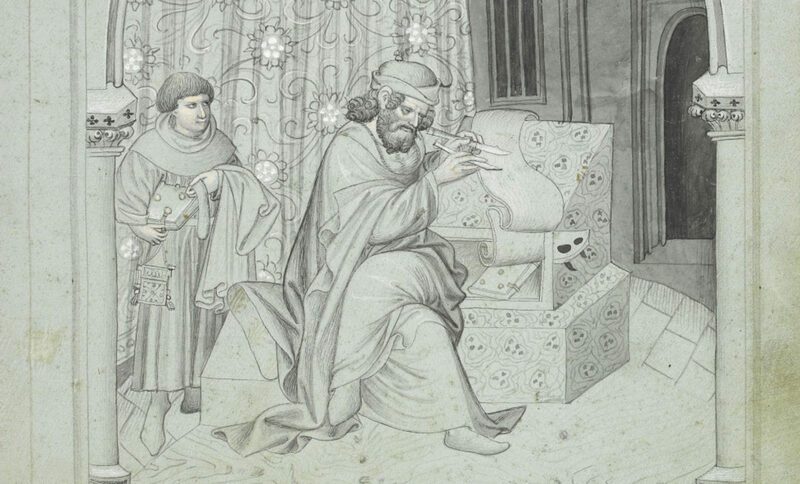 The task of illustrating seemed enormously risky. I stared down at the blank piece of animal skin, shot through with blue veins (meaning the animal wasn’t bled properly, a phrase that makes me cringe) and felt my anxiety mounting. I didn’t want to waste this material; it felt too precious. “I’m sorry, Mr. Sheep,” I said as I dipped my goose feather in the ink, reflecting on how often scribes had to rely on the bodies of animals. I guess the best thing I can do is make something from your sacrifice, I thought. My vegetarian sentiments aside, I finally worked up the nerve to press the tip of my quill to the parchment. Once I made that first line, things became easier— therapeutic even, as I let myself sink into the work. Reproduction of St. Mary’s College MS 3 completed by Dalanie Beach and Abbie Spica. We made plenty of mistakes. Because I had, in my eagerness to begin the project, illustrated the background before Abbie added text, she was forced to work around the images in a way that limited her ability to correct errors. This caused some of our text to appear crowded. We also erred in making the first line of script black rather than rubricated, and thus had to go in later with red acrylic and paint over the letters. This was, Professor Noonan informed us, accurate to how a true scribe might have corrected such an error. Other mistakes occurred along the way, including smudged red ink, failed erasures using sandpaper, and slightly off-kilter illustrations. Minim confusion, Abbie confessed, was also something she struggled with. Nevertheless, we pulled through and found that, as a whole, the process was enjoyable for both of us. When we had finished with the essential lettering and illustrations, we decided to add a few flourishes. Abbie re-created a hole on the blank left page using an X-acto knife and sandpaper, smoothing it down to make it as realistic as possible. 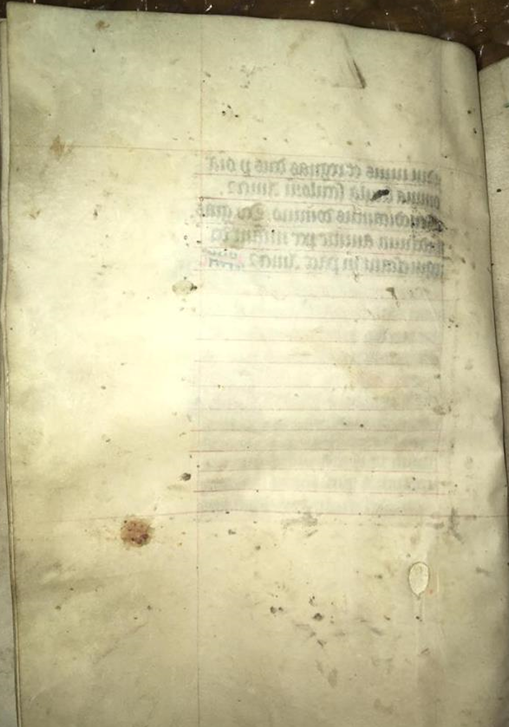 I added color to the edges of the folios, to give our fresh parchment a more “aged” look, and imitated ink stains and blemishes on the surface of the original. These were added mostly for aesthetic purposes, rather than accuracy— so that our finished product was more of an adaptation of our chosen folios rather than a true reproduction. We had created a work of art.